One theme of the 2018 election was that Democratic senators from rural, red states became an endangered breed. 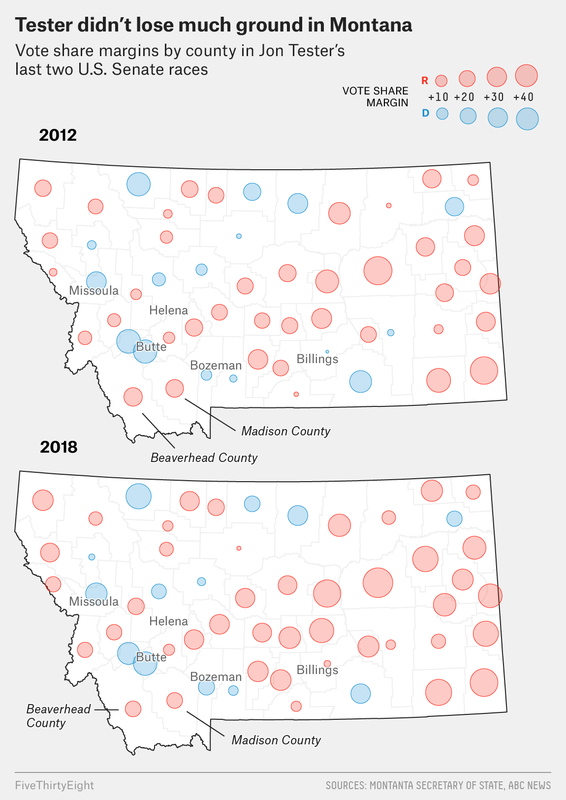 Three Democratic senators on deep-red turf1 — Joe Donnelly of Indiana, Claire McCaskill of Missouri and Heidi Heitkamp of North Dakota — lost their seats.2 Two others managed to squeak out wins — Jon Tester of Montana and Joe Manchin of West Virginia — but they saw their support shrivel up in many parts of their states. Let’s start in Indiana. After winning by 6 percentage points in 2012, Donnelly lost by 6 points in 2018. 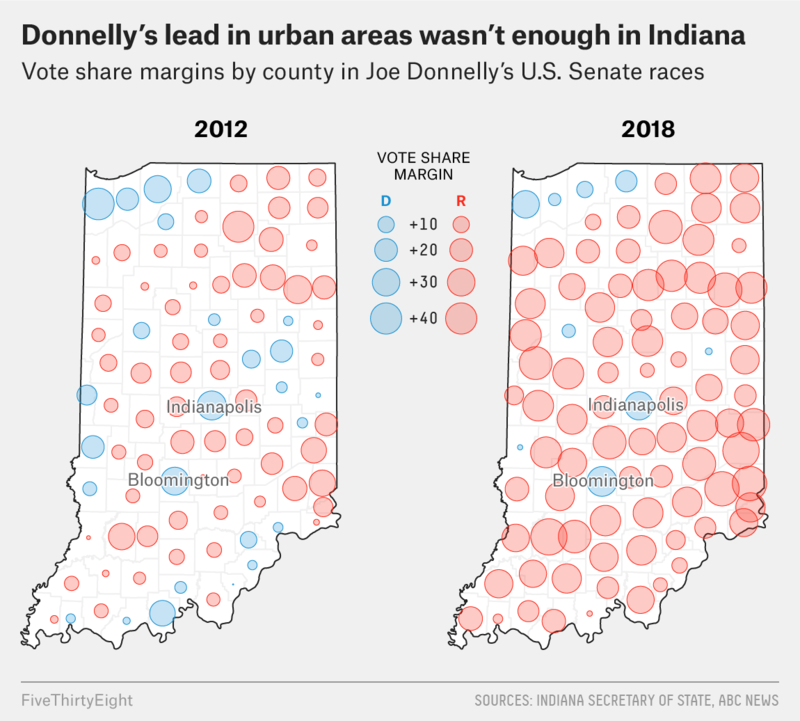 Donnelly improved upon his 2012 performance in only three counties — Boone, Hamilton (these two are in the Indianapolis suburbs) and Monroe (home of Bloomington, where the Indiana University flagship campus is located) — and even there, just barely. 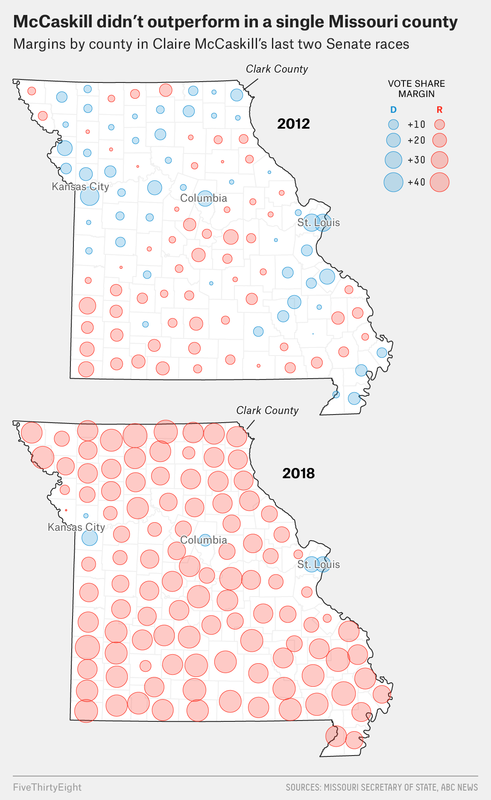 As you can see in the map below, the size of the circle — which represents the margin of Donnelly’s or his Republican opponent’s win — stays about the same in these counties. In contrast, the red circles in most of Indiana’s rural counties swell in size, representing how most other counties — especially lower-population ones4 — swung far out of Donnelly’s reach. Donnelly’s loss of rural support, coupled with his inability to make up for those losses with more votes in urban areas, sealed his fate. Democrats were probably lucky to hold onto the final red state we looked at: West Virginia. Manchin’s 24-point win in 2012 all but vanished in 2018; he won by 3 points. 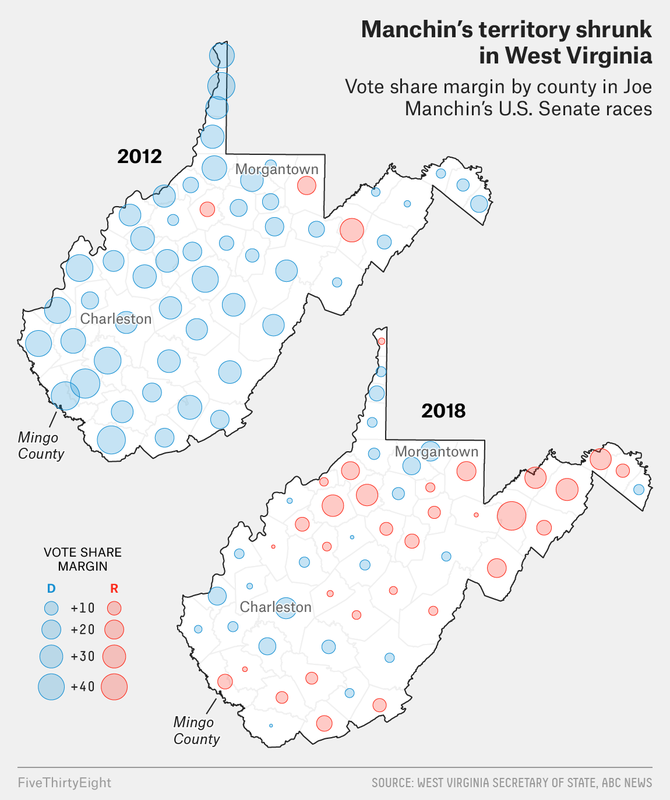 Manchin improved upon his 2012 margin in just one county, Monongalia (Morgantown).5 He more or less held steady in West Virginia’s largest county, Kanawha (Charleston), faring just 3 points worse. Manchin consistently lost ground in the remainder of the state’s mostly sparsely populated counties, including Mingo County, the heart of West Virginia coal county. Once reliably blue, Mingo County leaned 16 points more Republican than West Virginia as a whole in the 2018 Senate election. Perspective: In 1969, someone sent Robert Fink a telegram. It was finally delivered last month.